I just participated in my first relay, the Ragnar Washington DC! I'd been interested in doing a Ragnar ever since I first heard about it. 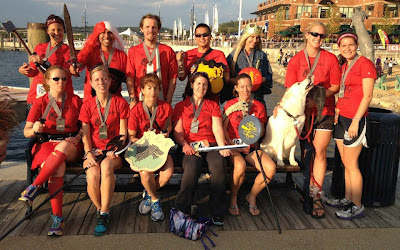 The Ragnar is a 200 mile, 12 person relay that runs over the course of two days and one night. Each person runs three separate legs of the relay and also helps support the other runners on the team. What a unique and fun experience it was! I Won an Age Group Award! I won 3rd Place in my age group at Parker's Marathon in West Virginia! Does it matter that this race had only 121 finishers? Does it matter that my age group only had 3? Not to me! I'm hanging that 3rd place medal on my bling rack with pride! It's a good thing I delayed my post about this race for nearly two weeks...because I only received my age group medal in the mail last night. I was very surprised, because I was quite slow compared to my recent marathon times. For some reason I was very, very tired, and my calf was bothering me where I'd had a stress fracture last year. I did a lot of walking in the second half of the race, but of course, I finished! Rockin' 'n' Rollin' in Providence! Only one week after my nasty knee skinning during a training trail run, I headed to Providence, Rhode Island to run the Rock 'n' Roll Providence Half Marathon. This was a warm-up of sorts, as my jump back into full marathons starts next weekend in West Virginia. Before the Providence race, my most recent big race was Grandma's Marathon in June. I spent the interim months working on improving my speed and doing some strength training on a more or less (umm...well, mostly less) consistent basis. But it paid off! I set a new PR in Providence and bested my June half marathon PR by almost 3 minutes! My weekend started out with a Friday evening flight to Hartford, Connecticut to hook up with my childhood friend Sherri and her friend (well, now MY friend too) Joan. We drove to Providence on Saturday and had much fun posing for silly photos at the expo. Am I an official trail runner now that I have battle scars? I hope so. Tell me I didn't bloody my bloody knees in vain. If you don't like the sight of blood, it's probably too late. You can already see my beautiful knees in all their gory glory below. I'm back on the blogging wagon! I got busy, I got distracted, I realized I couldn't keep up with everything I was doing this past spring, so I let my blog slip. But I'm back. I still have so many races to catch up on, and many new ones scheduled for this fall and winter. So, this is just a quick note to let everyone know what I've been up to since my last blog post in...gulp...April. Wow! It really has been a while! I plan to add more details about some of these races as I go, so here are just some highlights. 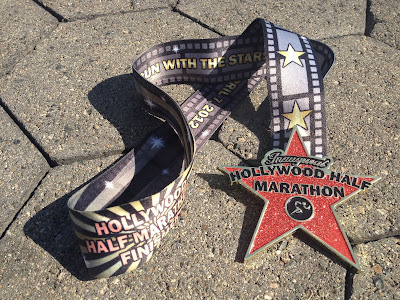 My last race report was the April 7th Hollywood Half Marathon. 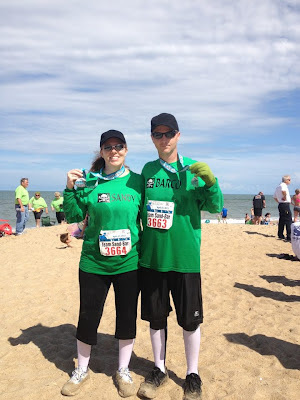 Then I went to the Outer Banks of North Carolina to run the Flying Pirate Challenge: a 5K on Saturday, and a half marathon on Sunday. But that wasn't enough. I also teamed up with Marathon Maniac #5182 Scot Barco as "Team Sand-Bar" to run the Storm the Beach 5K, an obstacle course on the beach. Running in sand is hard without obstacles, and even harder with them, but it was fun. I have a home in an asylum. Well, two homes really. Am I crazy? 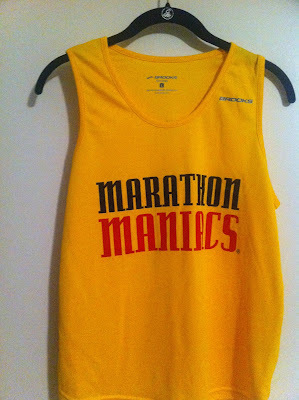 You decide: I am a Double Agent, a member of both the Marathon Maniacs and the Half Fanatics. Our club is called The Asylum because you really do need to be a little crazy to belong. But why wouldn't I want to join The Asylum? It's become a community of runners to me. I meet new members at different races, make friends, share couches when traveling to races, and keep in touch between races through Facebook. I belong to several Facebook running groups and one of the recurring themes is: what do you eat and drink during a race? 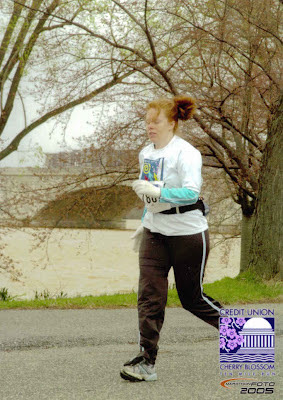 The answers are as varied as the shapes and sizes of runners in a typical race. It's a darn good thing there are choices, because there is no one-size-fits-all solution. My best advice to new distance runners is to try various products in various amounts on your training runs close to home. When you find out what works for you, stick with it. So, what do I eat and drink during a race? I thought you'd never ask. Blossoms, Blossoms, Where are the Blossoms? The Washington DC cherry blossoms, that is. Well, they bloomed early this year due to wacky weather patterns and and a pre-mature Spring. So what was left for the annual Cherry Blossom Ten Mile Run on April 1, 2012 were fun crowds, beautiful sights, and pretty trees, but no major blossoms to speak of.